Saturday, May 17, 2003... Greetings from Corona, CA, an hour east-southeast of Los Angeles. I hope to take a few more photos before returning the car and flying home tomorrow. This morning's local-roads trip through Los Angeles went as well as I coul have hoped. With light traffic, I followed Ventura Boulevard through the San Fernando Valley and into Hollywood. Then I drove Sunset Boulevard past a bizarre combination of modern office buildings and film studios and 50-year-old motels, which presumably survive because their owner's waiting for the price of the underlying land to increase. The current, freeway-based version of 101 ends in downtown Los Angeles. The older version continued through downtown and veered far to the east before heading south to the Mexican border just north of Tijuana. Although I've been in L.A. at least a dozen times, this was my first trip through the actual central business district, a group of office towers similar to those in other cities. What wasn't similar, though, was the utter absence of restaurants, delis, small shops and other amenities usually associated with business districts. Everyone in these towers must drive elsewhere for lunch. 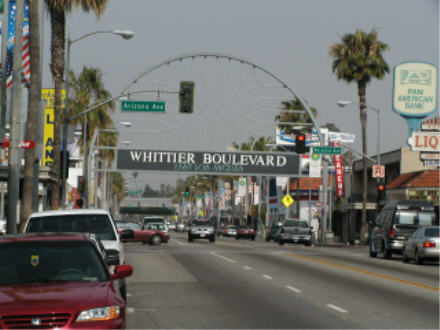 After crossing the Los Angeles "River," old 101 becomes Whittier Boulevard, which in turn became the title of a 1960s rock instrumental by Los Angeles' Thee Midniters. Whittier Blvd. ran due east to the Los Angeles county line. Shortly after it crossed into Orange County, I jumped on the southbound freeway. The road passed right by Anaheim Stadium -- the first time I've ever seen it -- before rejoining I-5 and returning to the coast at San Juan Capistrano. 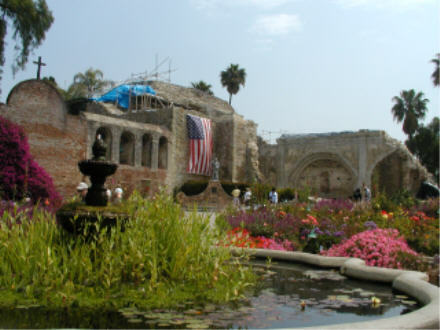 Mission San Juan Capistrano calls itself the "Jewel of the Missions." It may well be; surely none of the others have as elaborate a garden. The mission is also known for its swallows, which according to tradition return to the mission each March 19, St. Joseph's Day. This tradition prompted Hinckley, Ohio to celebrate March 15 as the day the buzzards return to its less picturesque community. I continued south on I-5...which came to a virtual stop just south of Oceanside. It took me 45 minutes to cover the next 10 miles, with no accident, construction or other obvious cause for the delay. (Later, on my drive north, cars twice slowed from 70 to about 25 for no apparent reason.) I left the Interstate just south of downtown San Diego for a final push toward the border on the old road. At National City, old 101 passes through a mile-long stretch of auto dealerships, neatly arrayed in a "Mile of Cars" for convenient comparison shopping. After catching up on the past few years, we parted. I drove north; they went immediately to sleep. Now it's my turn to sleep. Later!